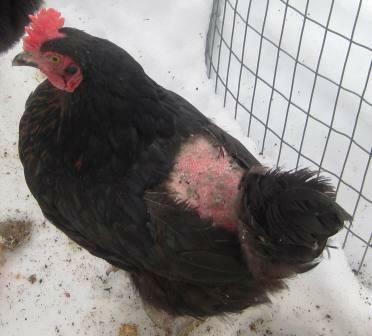 Last winter five of my chickens ganged up on Mooey, and pecked out all of her back feathers. One reason was because the coop was damp and wet. My son Ian and husband Bob renovated the coop to have yet one more door -- to collect eggs without tracking snow or water into the coop. 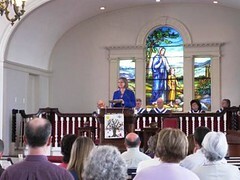 See video at left. Now there's a human door, two chicken doors and an egg-collecting door. 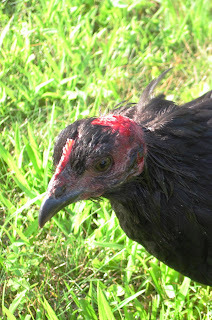 They did this last spring, and I've been enjoying the egg-collecting door all summer. I'm looking forward to using the egg-collecting door this winter as the weather gets colder and the snow flies. Although Mooey's plight has created a very interesting true bullying story that I share with students from K to 12 in elementary, middle and high schools. Kids relate to Mooey's plight, her position at the bottom of the pecking order and even to her becoming a bully when I brought four new chickens into the flock. 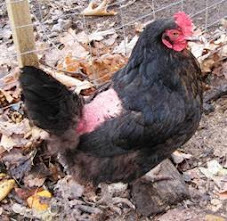 She became a brutal bully, and has pecked out the comb of two chickens, and drawn blood. It's very gory. Only look at the picture below if you can bear it. Mooey lacks empathy. She does to other chickens what was done to her, and worse and meaner.